That are Great for Adults Too! Perfect Party Games makes Kids Birthday Party Locations easy to find. Hey, I am a mom, and I know that kids parties at home are do-able. There is much fun to be had in your backyard. But there are some years where I just don't want to have the hassle. I would rather spend my time planning the games and activities and sometimes even baking my own cake rather than cleaning and fussing over the house. And then when the little party people leave, I am so tired I just ignore the mess for a couple hours (or sometimes worse...days). Moms and Dads out there know exactly what I mean. 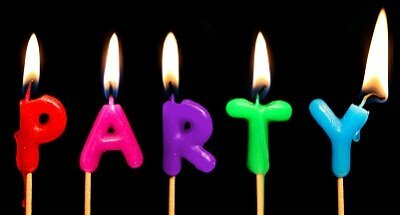 So I have put together a directory for kids birthday party locations in the United States. It is organized by state and then by city. You will find quick links to each state in the right hand column of this page. When you visit the website of the party location you might be interested in, check to see if they have a specific party page or birthday package deal. Most sites will highlight these so you can get the most for your money. Don't think these locations are only for kids birthday parties either! They are great fun for adults as well. I had my 35th birthday party at the Laser Quest and all my friends had a great time. They had a birthday deal where the group got a discount, plus we had an enclosed room to ourselves for between game chit chat and place to eat and open the gifts.